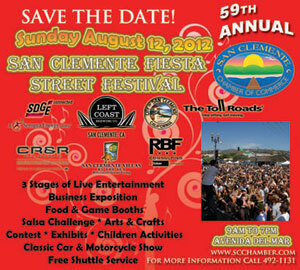 FIESTA Street Festival in San Clemente this August 12th 2012. Posted by Teresa Mihelic HelpDesk on Wednesday, August 1st, 2012 at 3:01pm. The San Clemente Fiesta Street Festival is presented by the San Clemente Chamber of Commerce and participating sponsors. It is a unique family-orientated event, held on the second Sunday in August from 9:00 a.m. until 7:00 p.m. on Ave. Del Mar in beautiful San Clemente. The Fiesta Street Festival Block Party represents a variety of activities that attract numerous families and visitors to the Southern California Coast year after year, approximately 25,000 people will attend this party. The San Clemente Street Festival is held on picturesque Ave. Del Mar, where the two main blocks of downtown San Clemente are dedicated to an entire day of FUN. The San Clemente Fiesta Street Festival - This event features activities for the whole family, including: Food and game booths sponsored by local nonprofit organizations, three stages with continuous live music throughout the day, contests for all ages, a Salsa Challenge, arts & crafts show, Members Only Business Exposition, kiddie rides, a classic car & motorcycle show, exhibits, clowns, jugglers, face painters and much more. The Fiesta will feature an arts & craft show. This exhibit showcases hand-crafted and unique merchandise from talented individuals from Southern California. There are many special activities for children, featuring: A Family Petting Corral, Jump House, Children’s Rides, Contests, Face Painters, Balloon Art and more. Auto & Motorcycle buffs will want to visit the Classic Car & Harley Bike Show. Vintage cars from all over Southern California and as far away as Arizona enter the Classic Car Show. Harley motorcycle enthusiasts will enjoy a variety of exceptional bikes on display. Trophies are awarded in many categories. The U.S. Marines, U.S. Navy, U.S. Air force & the U.S. Army will all be displaying vehicles and information. Other exhibits include: Pet Project Foundation, U.S. Border Patrol, K-EARTH101, Orange County Sheriff’s Department, San Diego Gas & Electric and many more. This is one of the many events the city of San Clemente offers and what makes the San Clemente residents love where they live. Are you ready to start looking for San Clemente Real Estate?